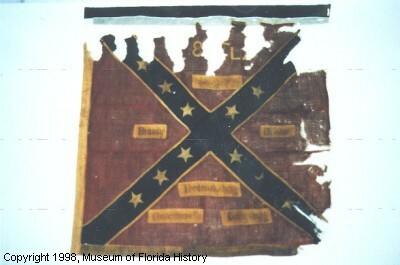 The 8th Infantry Regiment completed its organization at Lake City, Florida, during the summer of 1862. Its members were raised in the counties of Walton, Washington, Jackson, Santa Rosa, Escambia, Leon, and Gadsden. The unit was soon ordered to Virginia with a force of 950 men, and brigaded under Generals Pryor, E.A. Perry, and Finegan. It was prominent in numerous battles from Second Manassas to Cold Harbor, endured the hardships of the Petersburg trenches south of the James River, and fought in various conflicts around Appomattox. The regiment reported 7 killed, 37 wounded, and 44 missing at Fredericksburg, had 11 killed and 28 wounded at Chancellorsville, and lost fifty-nine percent of the 176 engaged at Gettysburg. Only 4 officers and 28 men surrendered with the Army of Northern Virginia. The field officers were Colonels Richard F. Floyd and David Lang, Lieutenant Colonels William Baya and John M. Pons, and Majors Thomas E. Clarke and William J. Turner. Our Hagin Family begins with John Hagin who was born about 1740 probably in North Carolina. All research points to Northern Ireland as the origination of the line. It is unknown to me at this time when the Hagin Family emigrated to the United States. I have found Hagin names recorded in North Carolina as early as 1715. The family journeys from North Carolina to Georgia to Florida and beyond. John , a Revolutionary War Soldier moved from North Carolina to Effingham County, Georgia probably between 1785 and 1790. The narratives below are based on my research over the past few years. I believe it to be accurate but as always in researching and documenting a families history there is room for error in the quality of old documents, census records are not infallible and sometimes a researchers interpretation of findings can be incorrect. In the narrative below I have given details on my direct line of ancestors and only mention others as I thought benefited this narrative. Further details on other names mentioned here, may be found on this site at the links page. Please go to the links page on this site and click on the link to the Hagin family Genealogy Page. Martha, born between 1790 and 1799. A Revolutionary War soldier, John moved to Effingham County, Georgia during the latter part of the Revolutionary War. I believe that John sold land in 1786 in North Carolina and moved to Georgia shortly after that. Among the earliest settlers along the Ogeechee River in the eastern part of Georgia were the families of the Cones, Williamses, Laniers, Hagins, Hodges and Burkhalters. A land grant was given to John Hagin in Effingham County, Georgia for 650 acres in 1791 and an additional land warrant for 100 acres was issued to John Hagin in Bullock County, Georgia on 9-5-1796. James Bird surveyed these 100 acres on November 2, 1797. In the formation of Bryan County out of Effingham County the Hagins were placed in the new county and in 1796 by a similar change were placed in Bullock County. On June 13, 1795 an indenture was made between John Hagin of Bryan County to sell to John Lowther of Bullock County for 5 shillings sterling, 100 acres being part of a tract of land John Hagin received on December 25, 1793. John Lowther was the husband of John and Marys daughter, Mary. The transaction was recorded on November 14, 1796. The witnesses were William Williams and Absolom Hagin. On January 3, 1801 an indenture was created between John Hagin, Planter and his wife Mary and David Lee, all of Bullock county, $50.00 for 50 acres, part of a tract of 300 acres granted John Hagin and bounded by said John Hagin and Robert W. Powell's land. David Lee was the husband of John and Marys daughter, name unknown. This was recorded on February 13, 1802.The witnesses were Elias Jernigain and James Bird, JP. On April 11, 1803 John Hagin, planter Bullock County, sold to William McCall and Josiah Everitt, planters Bullock county, for $1000.00 - 900 acres in three tracts in Effingham County now Bullock County on Spring Creek adjoining O. Bowens. The witnesses were John Lowther and David Lee, sons-in-law to John. Mary Hagin quit claim on above land. This was recorded on February 10,1806. This William McCall was the same man who in 1803 along with Malachi Hagin, Johns son, would be granted a passport for exploration of South Georgia and North Florida. More will be covered in the section on Generation 2, Malachi Hagin. 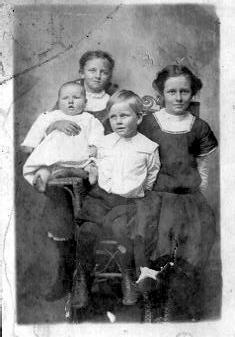 The last three children are shown in the 1850 Marion County Florida census with Malachis widow, Elizabeth. Their ages and the ages of Malachi and Elizabeth at the time of the childrens birth leaves the question if they were children of Malachi and Elizabeth or possibly grandchildren or other relatives. Wheras the Justices of the Inferior Court of the county have received information on oath by Malechi Hagin that Jermiah Hill is about wasting the property in his hands belonging to the heirs of John Louther, dec'd. He being guardian of said heirs upon which: It is ordered by the said justices that Malechi Hagin and Etheldred Hagin, securities of the said Jermiah Hill, have power and authority to take into their or either of their possession and care all or any part of property belonging to the heirs of John Louther, dec'd. Which is or may be in the possession of Jermiah Hill guardian of said heirs and safely keep said property until further proceedings can be had thereon. And it is further ordered that Jermiah Hill will be summoned by the clerk of this court to appear at the next sitting therof in order to give other security as guardian as aforesaid. Malachi journeyed into Southernmost Georgia and Northeast Florida as early as 1803 based on a passport issued in Bullock County, Georgia to he and William McCall to explore those areas. A passport was required to pass through the Creek Indian Territory. A photo of the passport can be viewed in the Hagin Photo Album on the photo page of this site. They apparently explored that region for the family prior to 1810 since his Father John, his brothers John and Thomas as well as his brother in law Giles Ellis (husband of Elizabeth, daughter of John Hagin and Mary Townsend) were in Camden County, Georgia by 1810. Malachi was in Camden County by 1822 according to his brother Johns will issued in that year. Malachi, his brother Thomas and his brother-in-law Giles Ellis (husband of Elizabeth, daughter of John Hagin and Mary Townsend) were all in Duval County, Florida and or Alachua County, Florida by 1826. Malachi and Elizabeth are found in the 1810 and 1820 census, Bullock County, Georgia, in the 1826 census Alachua County, Florida, and in the 1830 and 1840 census in Duval County Florida. Malachis widow Elizabeth is found in the 1850 census of Marion County Florida. The Marion County census does not list Malachi but it lists his widow and some children as well as his son Ethelbert in another household with his wife. Malachi and his family along with his brother Thomas and his family are listed as suffering inhabitants whom received rations at Ft. Heileman in Black Creek, Duval County, Florida in 1837. They are identified as residents of Duval County. More details on this as well as a copy of the Ft. Heileman list may be found on this site at the links page. Please click on the link to the Hagin family Genealogy Page. Malachi, his brother and at least two of his sons, Ethelbert and Francis are listed as belonging to the Florida Militia during the Seminole Indian War. Malachi lost all his possessions during the war. He lost most of his livestock to the Indians and other possessions were burned by United States Troops so the Indians could not get them. Malachi was a blacksmith and wheelwright as well as a merchant in the area of Micanopy. Malachi filed a claim against Congress trying to obtain the monetary value of the lost possessions. That claim was filed at least 3 times and apparently finally denied. More details on this as well as a copy of the claim may be found on this site at the links page. Please click on the link to the Hagin family Genealogy Page. A land grant was issued to Malachi Hagin in Bullock County, Georgia for 16 and 1/2 acres in 1851 and a land grant was issued to Malachi Hagin in Tattnall County, Georgia for 35 acres in 1853. Malachi J. was elected Sheriff of Tattnall County in 1858. He enlisted in the 61st.Georgia, Tattnall Rangers, Company B, Confederate States of America on August 31, 1861 along with his sons, Stephen, Joseph and Peter. His 4th son John Mitchell, my G Grandfather, joined the 8th Florida, CSA, Co. I in 1862. John joined the 8th Florida Co. I in 1862. After the war John and Mary Ann left Tattnall County in 1870 or 1871 and traveled to West Central Florida along with at least two of his brothers, Stephen and Malachi. Also in the group was Mary Anns mother Elizabeth and Stephens wifes parents James Smith and Harriet Pierce McCall Strickland. John settled in Alafia, Hillsborough County, Florida. 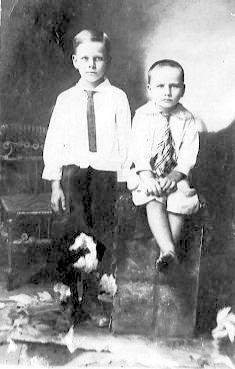 His brothers settled in what is now north Tampa in the present Day Lake Carroll area. His brother Stephen and Stephens wife, Anne Jane Strickland Hagin and some of their children are buried in Lake Carroll Cemetery on Armenia Avenue in Tampa. Annes parents, James Smith and Harriet Pierce McCall Strickland, are buried in the Keystone United Methodist Cemetery, 16301 Racetrack Road, Keystone, Hillsborough County, FL. 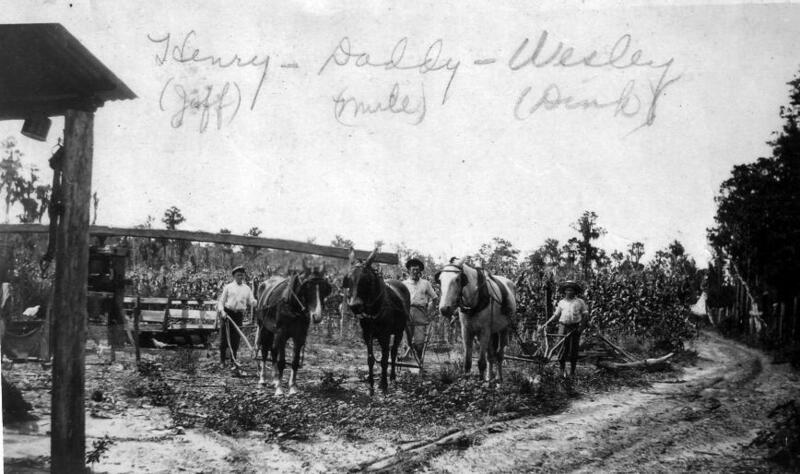 John homesteaded 80 acres of land in Alafia, Hillsborough County, Florida and obtained a deed for the property in 1890. The property was located on present day State Highway 39 at Keysville Road. The 1885 Hillsborough County agricultural census shows John had 6 acres improved; 4 acres in pasture, vineyards, orchards, etc. ; 80 acres unimproved. Farm was listed as having a value of $300 and livestock with a value of $75 with the value of goods sold or consumed at $100. John and Mary Ann and some of their children are buried at Cedar Grove Cemetery, Alafia, Hillsborough County, Florida. Mary Anns mother Elizabeth is buried there as well. John first worked in the lumber business for Warnell's Mill, dragging logs by oxen to the Alafia River and floating them downstream to the mill. John was a carpenter and built many houses in the area. 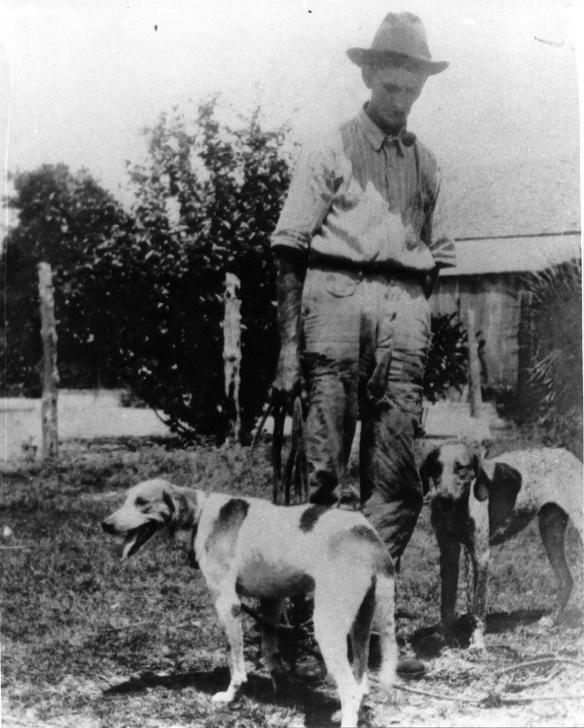 John farmed and raised some of the first cattle herds in Hillsborough County. Area square dance music was provided by John and Nancy, he on his fiddle and Nancy on strings. Due to the lack of undertakers in the area, John built caskets for the community as needed. Nancy padded the caskets and lined them with silk, then they were covered with silk since the wood was unfinished. The Hagin's were among the pioneers who started what is now known as The Old Timers' Picnic at Alderman Ford Park on Highway 39 on the Alafia River, 1/2 mile south of the Hagin homestead. For a time John was a foreman at Swift and Company's mines. In 1947 he moved to Perry, Florida and built his last home. It was located south of Perry on US 19.